A US-based research institute on Tuesday released what are believed to be the first publicly available satellite photographs of North Korea's rocket launch. 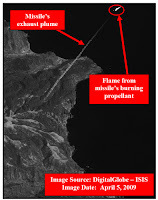 Satellite image released by the Institute for Science and International Security taken by Digitalglobe, shows what appears to be the Musudan-ri North Korean rocket or missile in flight. The Institute for Science and International Security in Washington released satellite photos taken by DigitalGlobe, which showed the missile's exhaust plume and flames from burning propellant. It said the images were taken a few kilometres away from the launch site at Musudan-ri on the northeast coast. North Korea says its Sunday launch put a peaceful experimental communications satellite into orbit. Washington and its allies say the real purpose was to test a Taepodong-2 missile in defiance of UN resolutions. South Korea, Japan, the US military and a senior Russian official say no satellite has been detected in orbit. Foreign analysts have described the launch as a failed test of a long-range missile. They say the second and third stages apparently failed to separate, causing the rocket to crash into the Pacific short of the designated area. South Korean analysts said the Taepodong-2 missile still travelled some 3,200 kilometres (2,000 miles) -- double the range the North achieved in 1998 with a Taepodong-1 launch.